jtidirect has no other items for sale. Contact must be made within 3 days of auction close with your full shipping address and method of payment. People at Hawaii,Alaska, outside US please contact me for shipping fee PAYMENT MUST be received within 10 DAYS of auction close. All sales are final, NO returns,I will not be responsible for damage goods due to shipping w/o buying insurance. All checks are held 7 business days before shipping. Please E-mail me with any questions prior to bidding. Item was of good quality. It only goes from english to spanish. My old Franklin was a 270,000 word two way translator. This one has limited english word capacity. It won't translate whole words such as shovel. It truncates it to lantern, for example. Other wise is is a good value for what it does. It works fine. It's just, obsolete now, because of wireless phones. 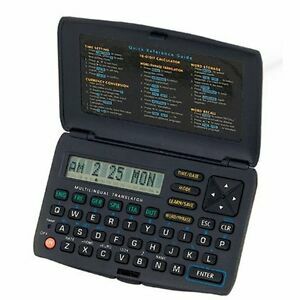 Translator apps, calculators, and monetary exchange rates, can all be found on wireless phones. I, honestly, don't know why I bought it. I have a wireless. It is a slow and awkward way to translate words.